VATICAN CITY (CNS) — The current economic model that places profit over the common good of all human beings must change in order to confront the challenges the world is facing today, a Vatican official said. The world must heed Pope Francis’ warning of the dangers of “an economy of exclusion and inequality,” Ghanaian Cardinal Peter Turkson, president of the Pontifical Council for Justice and Peace, told participants at a conference studying the pope’s views on the economy. “We need a new social economy to meet the challenges of the present day, one in which the human being is firmly at the center, where all are included in economic social life, and where creation is cherished and protected,” Cardinal Turkson said. The Sept. 13 event, titled “The Economy according to Pope Francis,” was sponsored by the Pontifical Council for Justice and Peace and the embassies of Germany, the Netherlands and Austria to the Holy See. In his speech, Cardinal Turkson highlighted the pope’s warnings on the “liquid economy,” or an economy judged by the ease with which assets can be converted into cash, and therefore focusing more on finance than on labor and the production of goods. “For Pope Francis, a liquid economy goes hand-in-hand with a throwaway culture. 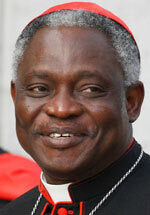 This is the ultimate economy of exclusion,” Cardinal Turkson said. The pope’s call for the world to move from a liquid economy to a social economy, one that “invests in persons by creating jobs and providing training,” is a solution that shifts the priority “from economic growth and financial health to human flourishing and the ability to live well,” he said. To achieve this, the cardinal continued, the principles of solidarity, subsidiarity and the common good highlighted in Pope Francis’ encyclical on the environment, “Laudato Si’,” can be applied to the modern market economy. These principles, he added, also can be applied to global problems “that do not respect national boundaries” and therefore call for a unified response. Global issues such as unemployment, inequality and environmental degradation can be remedied by moving toward a social market economy, Cardinal Turkson said. However, global and business leaders also must come to terms with the causes of such problems. “More and more people are being discarded as machines take up their tasks. And as technology gets more and more advanced, what will a ‘robot economy’ mean for workers?” the cardinal asked. A new social economy, he said, must be respectful of nature instead of relying on “old-school industrialization,” making the world dependent on oil, coal and gas. Extreme pollution, climate change and the destruction of vital ecosystems caused by such industrialization will continue to push people into extreme poverty “if we fail to act,” he said. NEXT: Mother Teresa upheld as the human face of eternal hope at U.N.